It’s a sleek, new tabletop printer and encoder. And its maker calls it an industrial, multi-protocol RFID solution that excels in on-demand smart-label printing and RFID tag encoding. Enter Zebra Technologies’ new R110Xi high frequency printer, built on the Vernon Hills, Ill.-based company’s XiIIIPlus Platform. Vernon Hills, Ill., October 10, 2006-Zebra Technologies Corporation (NASDAQ:ZBRA), a pioneer in bar coding and RFID solutions for business improvement, today released the R110Xi high frequency (HF) radio frequency identification (RFID) tabletop printer/encoder, an industrial, multi-protocol RFID solution that is suitable for high-volume and on-demand smart label printing and RFID tag encoding. 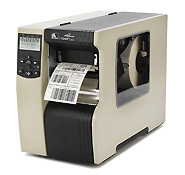 Zebra is the only company that offers both desktop and tabletop models of HF printers along with ultra-high frequency (UHF) printer models, a full range of 100 percent compatible Genuine Zebr a smart media, ZebraCare services and ZebraLink printer management tools that work across the product range. The R110Xi HF encodes passive inlays using multi-protocols such as ISO15693 and ISO18000-3 mode 1, and is the first on the market to offer Philips MIFARE® ultralight support. Built on the proven XiIIIPlusTM platform, the R110Xi HF enables users to take advantage of 4-inch print widths, 203 and 300dpi print resolution and XML encoding for seamless integration into existing enterprise system with the addition of HF capabilities. Users also benefit from easy maintenance of a mixed population of RFID and standard printers using Zebra’s suite o f advanced printer management tools in ZebraLink. Plus, the full range of Zebra printers is supported by tested and 100 percent compatible Genuine Zebra supplies as well as ZebraCare service options. The R110Xi is available now in North America and EMEA with upcoming availability in Asia Pacific and Latin America. For more information on Zebra’s RFID solutions, visit www.rfid.zebra.com or call +1 847 423 0442.